PERCH Lake Simcoe is the most popular ice fishing destination in Southern Ontario. Once the lake freezes, ice shanty towns begin to populate the lake in large numbers. The lake becomes a winter wonderland, with ice huts, snowmobiles, ATVs, Portable Ice Fishing Huts, hundreds of open ice anglers, the lake is so busy on weekends, you sometimes forget you are actually standing on frozen water. Most anglers visit Lake Simcoe for it's famous jumbo perch. Early ice and late season are generally best for the biggest perch. The Lake Simcoe perch travel in schools, and many times when you catch one good sized perch, more won't be too far away. The key to a successful outing is mobility, fish an area for 15-20 minutes, if nothing bites, move. Perch bite readily and generally if you aren't getting any fish within 30 minutes, it's time to move. Lake Simcoe perch seem to be everywhere on the lake, although the most heavily targeted ice fishing areas are Gilford, Keswick and Virginia Beach. Most successful depths range from 9 feet to 35 ft. Many anglers use live minnows, either on perch rigs and panfish spreaders or just tipped on a small pixie spoon or jig head. Waxworms and mealworms can also be deadly, especially when fished near the bottom. In early March, the jumbo perch will move shallow in preparation of the spring spawn, this is the time of year ice fishing for jumbo perch is at it's best. 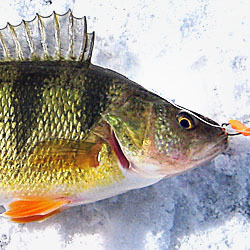 The jumbo perch will begin to school on shallow weed beds under the ice (generally in 8-10 ft). At this time of year, it's not uncommon to catch perch in excess of 14" in the 1 - 1.5 lb range. NORTHERN PIKE Lake Simcoe also offers excellent ice fishing for pike. Pike in excess of 12-14 lbs are not uncommon in the lake. The pike's main food forage is perch, and will inhabit the same areas where the perch are schooling. Pike are often caught while perch fishing, and can be a nice surprise. Ice fishing anglers targeting pike on Lake Simcoe, generally fish shallow under 10ft, and use large shinners, chubs or sucker minnows under a tip-up. Large dead baits such as smelt hooked on a deadstrike rig can also be deadly, especially during early ice. WHITEFISH One of the most sought after fish in Lake Simcoe during the ice fishing season is the whitefish. 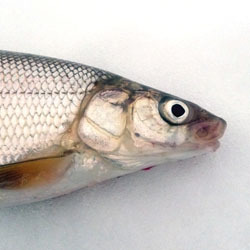 The Lake Simcoe whitefish is genetically unique in Ontario and grows larger than the whitefish commonly found in many northern shield lakes. Lake Simcoe whitefish are commonly between 3 - 5 lbs, although larger fish over 7 lbs are caught annually. Whitefish generally feed on small crustaceans, snails, insect larvae and small minnows. Although larger specimens, will feed on larger forage, such as smelt and young cisco. Anglers generally target whitefish in depths, in excess of 60 ft, fishing the bottom, with spreaders tipped with minnows. Perch or Pickerel rigs with small hooks, baited with lively pinhead minnows are also very effective, especially later in the season. Whitefish can be very aggressive, especially in the morning, and jigging spoons, such as the williams whitefish half-in-half or blue fox pixie can be productive. Meegs or Badd Boyz jigs, tipped with a minnow tail or small tube jig fished right on bottom is also a popular technique. Cisco and Whitefish generally inhabit the same areas in Lake Simcoe, and many Cisco are caught incidently. Each detailed map provides depth, contours, structure, boat ramps, and updated fishing information. 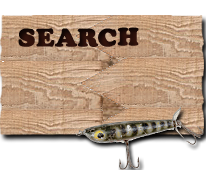 Ice Fishing Lake Simcoe fishing maps also include lake info such as gamefish abundance, forage base, water clarity, weedline depth, bottom composition, complete latitude/longitude grid lines and dozens of GPS waypoints & coordinates.